Assign keys to controller buttons when using the option fader controller and jog controller. When you set Behringer BCF2000 for this first, a message will appear to notify you that the preset must be installed. Select the preset No. to be installed from the [Preset No.] list, and click [Next]. Click [Start] to start the installation. This operation is needed only once and need not be performed from the next time onwards. 2Click the [Input Controller] tree, and click the fader controller or jog controller to be used. 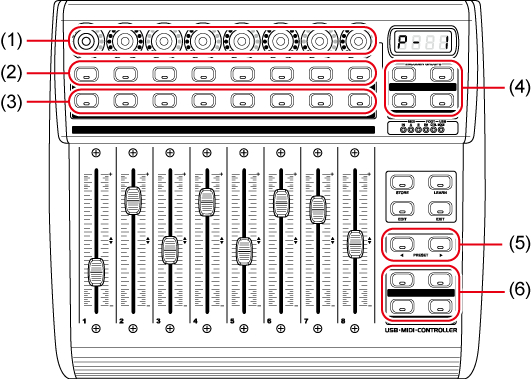 Displays an overview of the controller. Buttons assigned an operation are displayed in yellow. If you click a button to assign an operation to, the [Select Operation] dialog box appears. Displays the buttons, assigned operations, and repeat enable/disable setting in a list. Click the list and [Assign] to open the [Select Operation] dialog box. Click [Not Assign] to cancel operation assignments. Import and export controller settings. Select operation categories from the list to narrow down the items. Enter a keyword to narrow down the items. Displays operations available for assignment. You can also assign operations by dragging operations and dropping onto the buttons in the [Control] tab or the list in the [List] tab. Check this item to repeatedly perform an operation when a key is held down. Click this item and press any key on the keyboard to select the shortcut operation assigned to the key. Encoder knobs can be used as buttons. Select the operation that is performed when a button is pressed by the encode selection buttons. No functions are assigned to the rotation direction of the encoder knobs. These buttons function as the SELECT button for selecting the learning mode. These buttons are used for emulating touch operations. The touch sensor part for the fader is emulated. Press a button to set a break state, and release the button to set a release state. Select a preset No. To use this function from EDIUS, presets must be installed. These buttons can be customized with key assignments.